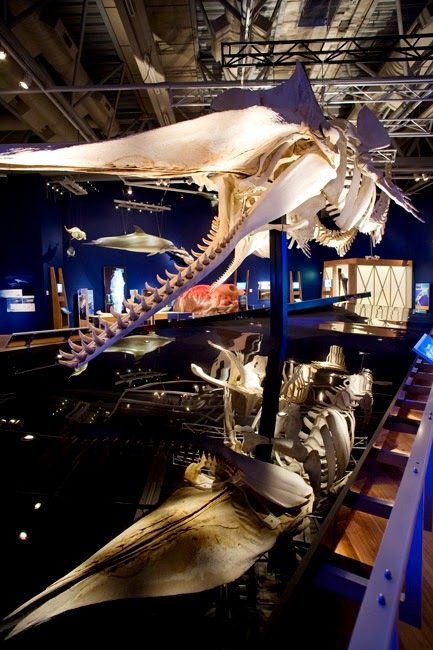 wanderlust ATLANTA: Whales: Giants of the Deep is AWESOME! Whales: Giants of the Deep is AWESOME! I'd been waiting for Whales: Giants of the Deep with great anticipation, for many, many months. Well, in the quintessential practice of presenting phenomenal feature exhibitions, the Fernbank Museum of Natural History again delivers. Photography is unfortunately not permitted in this exhibition. I remember so much more when I can review photos I made of an exhibit, especially one of this size. However, I am very grateful to Fernbank for providing the photos included in this post (Please do not copy, share or publish photos herein without permission from Fernbank). Unlike most exhibits in the same space, this one doesn't have a high-impact start—an artifact that stuns or delivers a huge "Wow!" factor. However, it builds quite nicely to its "Wow!" factor...multiple wow factors, in fact. I was impressed with how comprehensive this exhibition is. 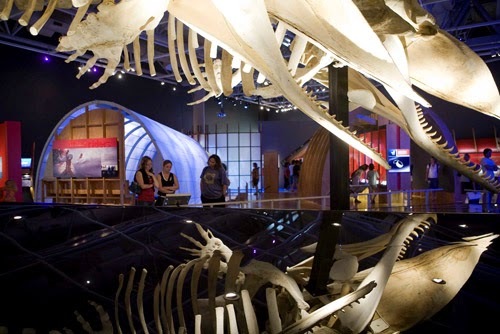 Visitors have multiple opportunities to discover whale evolution, explore their diversity, and uncover the details of how they swim, feed, mate, and sometimes become stranded on land. And they make it fun too...you can walk through a life-size whale heart, the size of a Volkswagen Beetle! Seriously. A Blue Whale is the same size as a 737 airplane; its tongue alone weights more than a whole elephant! At about 98 feel long and up to 330,000 pounds, Blue Whales are the largest animals to ever live on Earth. A Blue Whale can eat a remarkable four tons of krill per day in the summer feeding season! A tongue as big as an elephant!?!? And you thought you were already fascinated with whales! Most of my friends know how big of a cinema buff I am, so when I find a tie to Hollywood in an exhibition...BONUS! 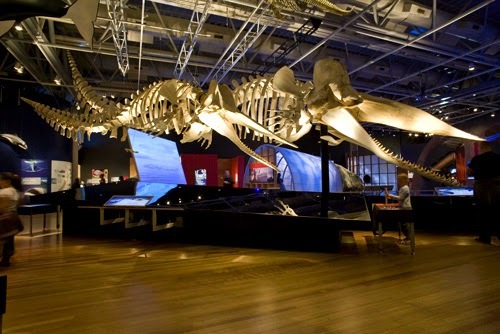 "One highlight is an authentic whale head model that forms part of one of the exhibition’s theaters. The Southern Right Whale model is an authentic artifact from the film Whale Rider, which brought the Pacific whale riding tradition to a worldwide audience." For me, the highlight of the exhibition was these two massive whale skeletons (pictured above), both longer than a school bus! One of them is a 58-foot-long Sperm Whale skeleton. The Sperm Whale is one of the most fascinating. They have the largest brain of any creature known to have lived on Earth...that in itself is rather thought-provoking. Their heads hold large quantities of a substance called spermaceti, which whalers once believed to be sperm. Scientists later theorized, but not before the whale was dubbed "Sperm Whale", that when the oily fluid hardens to wax when cold helps the whale alter its buoyancy so it can dive deep and rise again. 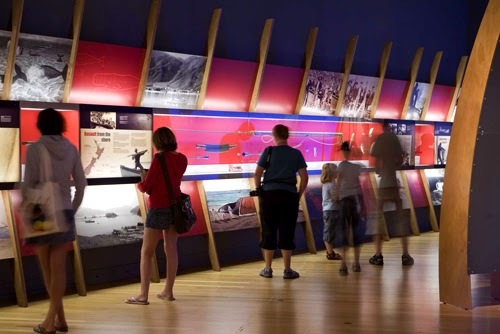 Visitors also get to listen to the voices of different whales and see how they use sound to navigate, find food, and communicate with each other. While you're at Fernbank Museum of Natural History, be sure to check out their currently running IMAX film Journey to the South Pacific (through June 5), narrated by Academy Award Winner Cate Blanchett. The film was shot in remote West Papua and features encounters with Whale Sharks (like the ones at Georgia Aquarium), sea turtles, manta rays and many other sea creatures. Whales: Giants of the Deep is on display through August 24, 2014. Make plenty of time to read the placards, watch the videos, and play when you visit...to be sure you get the most fascinating experience possible.